Silphium perfoliatum is beginning to bloom and not a moment too soon! The butterflies and bees have been waiting for its first flowers to open..they've been busy visiting ever since. Cup plant is one of my must have rough and tumble wildflowers. "What's a rough and tumble wildflower? "you might be wondering. They're beautiful and charming plants that are usually found growing in meadows, prairies and roadside ditches and they haven't had their best characteristics bred out of them. There are no cultivars or hybrids~That means they have not been crossed or genetically altered by human hand to be shorter, more floriferous, double flowered, disease resistant, sterile or what ever else is the going fad. I am pretty sure you can't improve on what nature has already done~creating plants that dance beautifully and gracefully with their pollinator and wildlife partners. Rough and tumble plants seem more beautiful to me then many classic garden flowers. I decided long ago that a plant had to have more than a pretty face to be invited to the Clay and Limestone wildflower party. Rough and tumble plants must also have excellent wildlife value and need no coddling. Cup plant more than fits the easy care/good wildlife value bill. Plant it where you want it to grow and then watch. Before it even blooms, there are wasps, flies, beetles, bees and birds stopping by to drink from the plant's "cups". The cup plant gets its common name from the large sandpaper rough leaves that are opposite and fused to form a cup around the square stem. Once it blooms there are dozens of bumblebees, carpenter bees, honeybees and butterflies stopping by to feed on the nectar and pollen that the daisy like flowers produce from late July till early fall. Come fall the seed heads are a tasty treat for Goldfinches. Cup Plant is a native wildflower of tall grass prairies where it grows in moderately rich, moist well drained neutral to alkaline soil. Expect it to make itself at home in your garden by setting down a central taproot and shallow rooted rhizomes. Site it carefully, once that tap root is settled in there's no moving it! It can and will spread vegetatively (and by seed) to form a large and tall colony that makes a striking statement in the back of a garden. Plant it with other prairie forbs and grasses to create a pocket prairie. It's almost too big for my small Susan's bed, so, I cut it back in late spring/early summer but, it's still over 7 feet tall by mid-July. I am not complaining, I love it and it's a great companion for the taller New York iron weed and Joe-Pye weed. However you decide to use Cup plant know that you are inviting a magnificent and assertive plant into your garden! It has good wildlife value and will provide a shady spot for critters to rest, to find water and food. It's practically perfect! PS Some particulars you might want to know about Cup Plant! Growing Conditions: Wet to mesic soils. Will tolerate clay soil. I am alive again for WW. Your photos are so vivid and detailed, i feel so envious. If only i can get our flowers and butterflies like you, we have a lot of colors and varieties. I only have one day in the province last weekend and i devoted it mostly repotting, not much for chasing butterflies, but they are everywhere! Dear Gail, that cup plant is a tall drink of water! HA It looks lovely in your susans bed and goes perfectly with the purple flowers that bloom now. Congratulations on your rough and tumbles and Happy Wildflower Wednesday! I like that one. I could use some tall, good-lookers in my garden. I featured Heliopsis in my post today. How could something so tall and handsome have escaped my notice? Awesome photos, Gail! I haven't been able to photo any critters drinking from my cup plant this year, but I did take some photos of the overflowing water in them after it rained yesterday morning. I love this plant, and hope I sited it OK. It's right next to our sidewalk. My thinking was that it would limit the spread, at least in that direction. The plant is probably 3 to 4 times wider than it was last summer. I deadheaded it last year so that I wouldn't have to deal with lots of new plants, but mostly, so the neighbors would not have to. I'm thinking about leaving a few blooms this fall, though. What a magnificent specimen! I have trouble distinguishing all the different yellow-blooming natives, but this one is so distinctive with its cup-shaped leaves. I have tried to grow this from seed I've sneakily collected here and there with no luck so far. But thanks for the warning about that taproot--if I ever get one going, I'll be sure to find a permanent home for it first. They are wonderful, Gail! It's that 'unstoppable urge to reproduce' that scares me off (so far!)though. I've culled so many cup plants from one of my client's gardens! This year we're trying deadheading them to help keep them under control a bit more. I suspect it won't be a foolproof method though, and next spring I may be tempted to bring home a culled plant or two. We do have a perfect spot for them way in back in an area I'm working on trying to tame adjacent to a poorly-maintained neighbor's yard where garlic mustard, burdock, silver maple, poison ivy, bindweed, and buckthorn seedlings are a constant headache. Maybe the shade of some tall, rough-and-tumble natives would help prevent the vacuum that leads to all those invasive seedlings. When I'm working in that client's garden, it never ceases to amaze me how attractive to pollinators her cup plants are - probably just about the most appealing plant to pollinators I've ever seen. That phrase is so telling! I pull it up and thin it so it doesn't take over, but, the leaves are such a great shape in early spring it's sometimes hard to rip them out! Planting them in a way back area is a great plan! Just lovely. It's definitely on my Must Plant list. This is my first foray into Wildflower Wednesday. Thank you for hosting it. I've never seen Cupflower outside of pictures. It's very pretty. PS - I presume the Cup Plant is herbaceous and dies to the ground after frost or a hard freeze? Do you leave the stems standing over winter or do you cut them to the ground in the fall? Aaron, it's a perennial and once the seeds are gone and the frost browns it I cut it to half size. Final clean up is in late winter when I remove all the spent stems of wildflowers. In your experience, does Cup Plant spread through runners and or self-sown seedlings? What a wonderful way to attract pollinators. I'm trying for more "rough and tumble" plants in my garden too because I like the results so far. I will have to find a nice wild spot for cupflower. This month I wrote about a plant that can harm humans. It's growing in plain sight along the roadways and most people don't know what it can do to them! Thanks for the I.D. of the cup plant on my post, Gail. After seeing the flowers on your plants, I had second thoughts, too, that the one in the Idea Garden might be a cup plant as well. Hi Gail: Thanks, again, for hosting. I love this meme! I've captured so many wildflowers this summer, it's hard to decide which ones to highlight. The Cup Plant is a great one--the foliage, the blooms, everything about it! What a nifty plant! Too bad we don't have it here down in the piney woods of east Texas. Still hoping to find me some Joe Pye. Great photos and information, Gail. I have thought about Cup Plant but am far from its range and wonder if it would become a problem here like so many other plants have. This month I am featuring one of my problem plants, Thimbleberries. Love the Cup Plant... I started seeds in the spring of 2012, and this year they are big and blooming! And thanks for Wildflower Wednesdays. I just transplanted some out to the new prairie garden and it is not doing too well. Guess I now know due to the tap root. I sure hope it recovers as it can grow all it likes. So pretty! I have a big patch of cup plant in the front garden, and also grow some along the alley. It's a great plant. You just have to be prepared for some heavy duty staking and to pull up seedlings. I would never cut down the seedheads because the goldfinches will gorge on the seeds. You're right Jason a heavy rain and a bit of wind and it's the leaning tower of daisies. The tall prairie grasses and forbs helped it stand up straight in the prairies. I never cut those seed heads off until the birds have eaten every last seed! Winter sun and Japanese flowering quince from me. Along with the usual suspects and their cohort of wildlife. Even our dreaded Oxalis, bane of California, is chowed down to stumps by caterpillars. This is the kind of site that I`m always looking for, I , too, am a plant collector in the wild. I got here from Rock Oak Deer, Shirley. Thanks! I was in Middle Tennessee in June and was jealous of the rain! A friend brought a tiny plant home in a paper cup. She had been to a native plant sale. It was planted in her yard and we watched it grow and grow and grow. Many comments about the "Jack in the Beanstalk" plant in her backyard. It turned out to be this cup plant. So tall and strong..needed no staking. i really enjoyed seeing this again. Cup Plant is a little iffy on my dry clay---just too grim to get a taproot into easily--but its relative, Starry Rosinweed, fills much the same niche and lord, you can't see the flowers for butterflies this time of year! I think every garden of size needs a Silphium! Love cup plant but it is slow to grow in my garden...perhaps I need to move it to a moister area. I will be linking in on Monday...a bit late this week. Finally got my post together, about three different kinds of Mimulus that I grow. I once had seeds for cup plant, but I never grew them. I'm not sure I have enough wild space in my garden for it. Love the post. Definitely interested in this one. It could compete with my Tall Ironweed and Compass Plant. Love tall, yellow flowers! The unstoppable taproot sounds a bit worrisome, lol! That's a beauty...and I was going to send you a photo and ask if a new plant that just showed up here was that...until I read the height. I unfortunately do not have one ...yet. I am so glad I decided to catch up on my blog reading today, Gail--your post prompted me to do a Wildflower Wednesday post for the first time in, well, years, I think. I love this lovely cup plant of yours, which I've only read about and haven't seen here. Hi Gail, sorry I've been away so long, my friend. I always love your posts. I have been thinking about cutting back my tall, leaning Persicaria. But dang, the bees just adore the flowers. Isn't it interesting how we change and grow, becoming more cognizant of the critters and their needs? 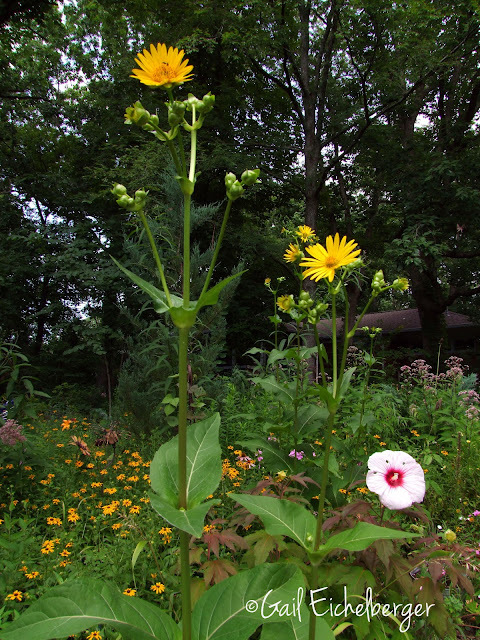 The theme for my September newspaper column is the "common" easy perennials that anyone with a patch of sun can grow--for themselves and the bees. Thanks for all you do to spread the word. I like Cup plant, we had it in Virginia in the Learning Garden. I see you didn't list SC. Too warm here?